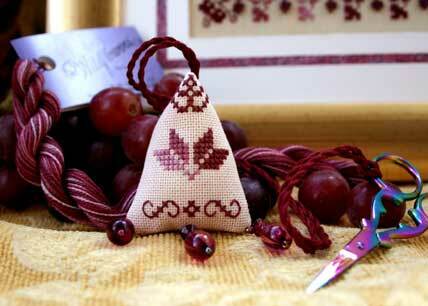 Watch for Carol's Pincushion Design next month. Please respect that this design is copyrighted and is for your own personal use and is not for resale in any format. Cut one piece of 14 count / 28 count piece of fabric approx 9" x 7 1/2" to work both the back and the front of the design. This design can be worked on Aida or Evenweave fabrics. 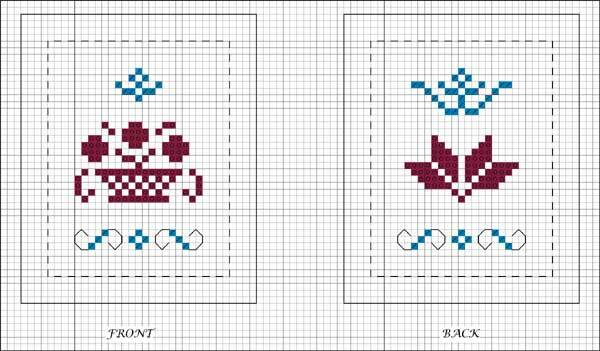 If you work this design on an evenweave fabric then every square on the chart represents working over two threads of the fabric. Complete all the cross stitches first. Caron Collection Wildflowers is a single ply thread and should be used as it is. 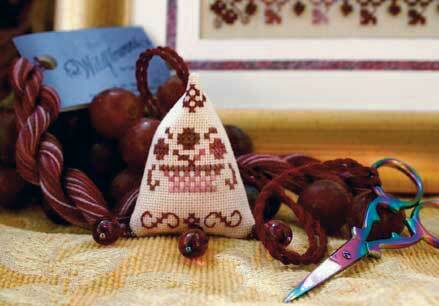 Work each individual cross stitch before moving onto the next to help to create a continuous colour flow. The solid black outer line is where you will cut the fabric once the stitching is completed. I would suggest using Fraycheck or similar around this cut edge to prevent the fabric from fraying. The dotted black line on the chart is where you should stitch the front and the back together. A Cross stitch on evenweave fabric. A Good Vintage and is available on my website. 1. Place Fraycheck or similar around the cutting edge line as indicated on the chart to prevent fraying. Wait for it to dry and then cut out the two pieces. 2. Place the two pieces of fabric, right sides together and sew around three sides of the fabric at the place indicated on the chart. The two side edges and the bottom edge. Leave the top edge open. 3. Very carefully press the seams of the two side edges open. Mind your fingers as you are dealing with very small pieces of fabric! 4. Fold over the top edges of the fabric to the back of the embroidery and lightly press so it holds its position. 5. Carefully turn your fabric the right way round so the right side of the embroidery is now on the outside. 6. Either make a cord from matching thread or use a piece of ribbon and carefully slip stitch into place on the inside where the seam is. 7. Push the two top edges of the fabric together so the seams are sitting directly next to each other and in the middle. With matching thread, carefully ladder stitch the two sides together. When you get to the seams in the middle stop sewing and through the remaining gap fill with some dried uncooked rice (this gives it some weight). Now finish stitching up the remaining gap. 8. I placed some beads along the bottom edge of my scissor fob to make it more decorative.